Last weekend I visited one of my old friends from Uni down in Southampton. On the Sunday we decided we would go out for a drive and see where it took us. While looking for something that was listed on my atlas as an 'abandoned village' we came across an interesting looking ruin on top of a large hill. 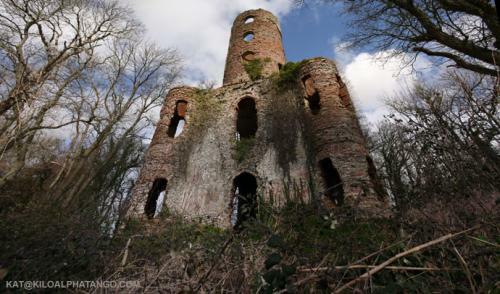 It took a while to find somewhere where we could park and gain access to what eventually turned out to be a folly. My friend and I both tried taking some panoramic shots of the building but at least in my case, they didn't come out that well - too many errors in the stitched images due to not having a panoramic head on my tripod but they are not noticable at smaller web resolutons so I have uploaded a couple of the panoramic shots that I took for you to look at. The odd compositions come from me cropping out the blank areas around the panorama so the the composition isn't that great but the picture of the monument looks OK enough for me not to be embarrassed by it after uploading. Racton Monument (Front): A view of Racton Monument, Sussex, from the front. Racton Monument (Side): A view of Racton Monument, Sussex, from the side. When we got back to my friends place at the end of the day we looked on the map and discovered that it is Racton Monument (or folly, or Tower) and some later Googling made it more interesting. Apparently the tower was built somewhere around 1772 and seems to serve no useable function. It's too small for someone to use as a house and the 'rooms' are only really big enough to put a staircase in the get to the next floor. I suppose you would have good views of the surrounding countryside given that it's situated on top of a big hill. Despite it's age, and the complete lack of flooring as can be seen in the previous link, there was a wooden window frame in at least one of the windows which I supose indicates that at least at some point, someone has tried to 'do it up' as I doubt that the original frame would have survived that long. It seems that the monument is mostly used now by kids as the place is full of rubbish, graffiti and broken glass but at one point someone was seriously thinking of renovating it. 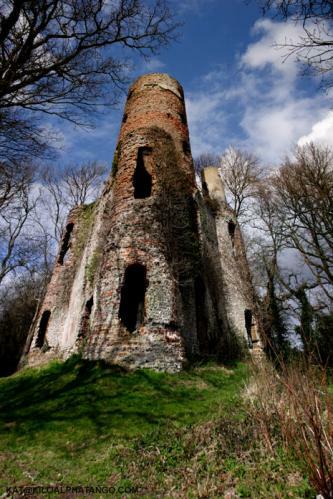 A Mark Talbot applied to Chichester District Council for permission to convert the folly to a dwelling in 1996 and was granted permission. In 2001 he reapplied for the permission to be extended and you can read all the file notes from the application along with his sketches of what it would look like. Obviously nothing has happened to convert the place but since Mr Talbot went to a lot of trouble to get the permission extended, I wonder why he never continued on with his grand plan for a house? I've got a lot to still put up as well but my mum, when she posts, only puts the main site address in the links she posts in other forums so they all point to the front page - I figure I'll leave it for a bit otherwise when I post, unless I don't put them on the front page, they'll disappear under the scroll window for users on small screens and it'll look like she's just spamming. I tried stitching your 'trees' panorama and it came out reasonably. You can still see a stitch line in places but I can ftp it to you if your tree one didn't come out ok. I might try stitching your 'inside the folly' panorama at the weekend. I'll leave it till then as it'll take a while to stitch on my computer so I'll set it to run overnight. not bein funny but you think how many people have died there we had 1 2 months ago who hung himself to be honest weird things has happened there and ghostly sightings have been seen so if this is a true thing rthen maybe it will be good left as it is. even if its fo the history off it myself and 7 others went there the other night stayed there for over an hour it was creepy but hopefully if its still up next weekend we are goin to pay another visit and have camera's with us to see it is a ghostly place. Funnily enough, I had thought of the address to other than the front page; I'll try to remember to post a full address to the particular entry next time. I hope you both are careful when visiting such "Follies" since the additional links seem to suggest that the building is in imminent danger of falling down. I still like the stitched picture of the Kaui tree you did for me. It's a pity we didn't get more of the people in the bottom of the picture so that the scale of the tree is more readily appreciated. Talking of trees, the Apricot tree in the garden is in full bloom and the magnolia buds are opening. The forsythia bush is a blaze of yellow flowers and the good old daffs are up once again. Spring is sprung, the grass is gris, and it's lawn mowing time again now that we don't have the guinea pigs to mow it for us. Speaking of guinea pigs (Smudge, Snugglepus, Whizz 1 and 2-I'm sure I've left one out), I still have their pictures together with the hundreds of others taken over the years which I still need to scan in to the computer when I have a spare year or so. John reminds me of the famous spelling mistake ---Smuge for Smudge. Very Cool PICS, very nice description could you add some more pics please, btw how old is this fort? me and my m8s went there its awsome we climed to the second floor. thre are many stories about the place very scary!!!!!! I'm intrigued by these stories....any that are not too rude to share? I found no mention of stories or urban myths about the place when Googling for information when I made the original post. And with just 4 short words my opinion of you has halved. I thought of not approving your comment but that wouldn't be honest. I then thought of writing a really witty and sarcastic comment back that disparaged you but unless you're careful you can end up looking an idiot yourself. Eventually I settled on just letting your words speak for themselves. I don't need to make you look silly as you already seem to have done it. Anyway...to make this comment relate to the original post: I did a quick 10 minute search for urban myths and stories with Racton Monument and came up with nothing. Admittedly 10 minutes is hardly enough time to say conclusively that there are no urban myths or stories about Racton Monument on the web but it does suggest that it's not exactly littered with them. Maybe there are none? Maybe they're just not interesting enough to write down or maybe the information is locked up in peoples heads rather than put on the internet? I guess given your comment we won't know. the main story that goes with racton is when charlie t hung him/herslef inside the tower. aparantly if you stand in the middle on a full moon and yell Rest in peace charlie t a ghost appears. What a strange and interesting 'folly'. If I had the money I'f tastefully renovate it myself - I't be awesome. Very interesting place. I wonder what it was used for. Me and a few friends went up there tonight. They were tryin to freak me out about it, and it was done well as soon as I saw the tree outside with "RIP CT" painted on it, and weird paintings underneath i could only make out a gouly faces. My friends got out of the car and were about to go inside, then they came running back after one said "what was the noise?". Like its been said, it could have been an animal, but really the pitch black, the tree, and just the fact that the building is creepy and has been rumoured to have had a hanging inside, is enough to freak you out. But now I've become really interested in the place. Doubt I'd ever go back though. I went to a rave here in the early days of acid house, before the police had caught on. we had been waiting for a phone call on the top of Portsdown hill and the nearest parking was at least a mile away. It was pitch black and we walked down the lanes towards the sounds. I remember one police man on a bike that eveyone was polite to. It was a wild night. proper rave. be warned though because he may not appear where u expect him too. ive herd stories the ghosts there recking cars. You posted some nice shots of that place. I especially like the second one. Not sure if you have more.The Racton monument fits goog with the blue sky. Hope to see more pics. Iv been there twice, once last night where i couldn't bring myself to go in & again today, there is R.I.P DAD written inside & flowers saying john as well as R.I.P CHARLIE on the outside. what happened to all of those people there? Since it's too old, built in 1772, I am wondering what prompted people at that time to build such tower? I am sure it was used to serve some purpose as there will be a history as to why such tower was built, maybe looks like for defense? I think such old buildings should be preserved well but I can't even find anything related to it on wikipedia, maybe browsing more on Google will help me to find some history or ideas behind building this monument. Ive lived in Emsworth all my life and have visited 'racton ruins' far more tmes than I can remember including recently, starting back in the fifties when a child. I have climbed up to the top of the side towers and across the front two over the upper opening when a brick came away and I was left hanging on with one foot and one hand. It has been vandalised some as witness the hole in the ceiling through to the upper tower, which is fairly recent. There are stories about weird things being seen including a horned entity gliding back and forth in field before rushing head on towards onlookers who fled quickly, details on one of the paranormal forums. The hells angels used to have parties up there in my younger years way before the rave scene. I have done some stitched pics of and am indeed thinking of a publication. As mentioned elsewhere I come accross the same book? mentioned in an earlier post in which there was an image of how it looked originally, a bit like a chinese pagoda with conical top, and if memory serves a walkway between the tops of the outer towers halfway up' though this was some 40+ years ago. I might post more later. Racton I think must be pretty unique both in its free accessability all the time Ive known it, and mysterious and neglected history. seems like its been a while since anyone has rote on this blog... but i have just got back from the ruins and im so freaked out, it was picth black and really foggy which made it even more creepy...... heard alot of stories about it but not sure if any of it is true? We visited racton ruins on friday last week, we found it a really interesting place, it seems that alot of people have had strange encounters up there but we didn't see anything out of the ordinairy. It would be great to get a sort of chronological timeline of its known history and any other odd occurrences. We would really like to find out more about the ruins as its a beautiful building which has been a bit neglected. Hopefully someone will oblige this request. Many many thanks. amazinly he walked away without a mark on him ? As a child I lived in Emsworth and visited the place many times as a child with friends we managed to climb to the first floor two or three times I seem to remember. I had no idea of its history but to his day have wondered about it - so thankyou all for your information and pictures The "stitching" looked ok to me.